Well, we don’t venture out camping very often, but last week we spent two nights in the great outdoors, so of course, I was excited to do a little dutch oven baking! I have made bread in our dutch oven before, baking it just in our home oven, and it works beautifully, but I was a little scared to try it outside. I decided to make soup, bread, and pie, but I was especially happy with how the bread and pie turned out. I used a bunch of granny apples I had on hand, and I went ahead and prepared the crusts (I rolled them out on parchment and put them in the dutch oven before we left), and then brought all the filling ingredients pre-mixed, so all I had to do was core the apples (we had to get a little creative for that), and then toss it all together and bake. Here’s the hubby and baby boy helping out with the cooking. 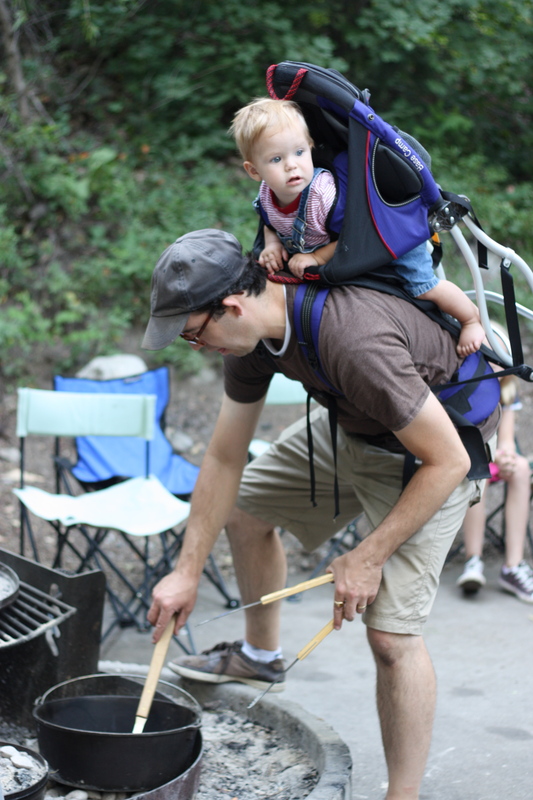 We didn’t realize until later that this was perhaps a little precarious of a situation to be putting our baby in (since he kind-of looks like he’s about to fall out of the backpack–into hot charcoals. Whoops). 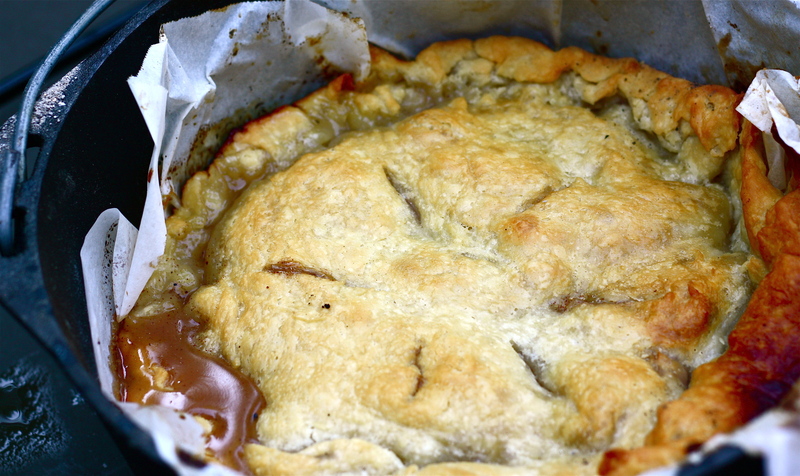 So dutch oven soup, bread, and pie were all a success, but I especially pleased when we opened the lid to the pie. It was like magic! Combine all ingredients except butter and let stand while preparing pastry. Line 10-inch dutch oven with pastry [I left the pastry on the parchment paper, and placed the dough and parchment paper inside the dutch oven, which also made for easy cleaning]; add filling and dot with butter. Cover with rolled dough for top crust. Seal and flute edge, then sprinkle crust with sugar. Make slits to allow steam to escape, and cover with the dutch-oven lid. If baking at home, bake for 15 minutes at 450 degrees, then reduce to 350 degrees and bake for 35-45 minutes, or until crust is golden. If baking outdoors, place 10 charcoals under the dutch oven and 12 coals on top of the lid, and bake for about 45 minutes, or again, until the crust is golden. Sift together flour and salt. Cut in 1/2 the butter until the mixture resembles small peas, then cut in the rest of the butter until the mixture resembles navy beans [I love these directions–never read anything like it before!]. In a mixing bowl, combine water, vinegar, and egg. Pour into flour mixture and mix lightly with fork until all flour is moistened and pastry forms a ball. Divide pastry into two portions (2/3 for bottom, 1/3 for top). Roll out between parchment or waxed paper.